All of KS2 were in the hall to see how the math’s team performed in the World Finals of the Maths in Motion challenge. 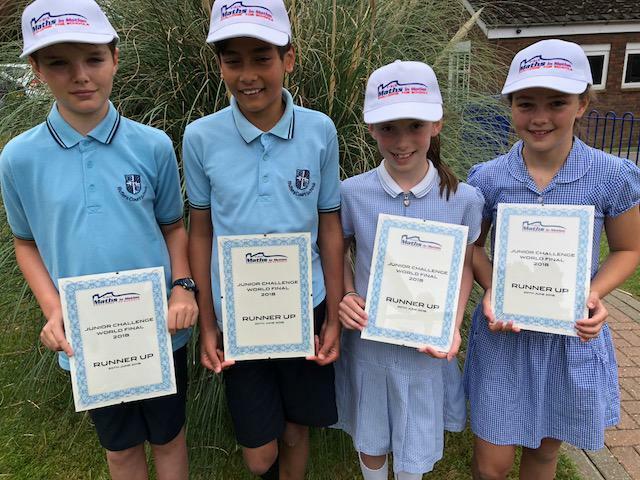 Competing against 14 other primary schools our team of Ben Watson, Adam Boodhun, Gabriella Edlin and Zoe Charalambous spent the morning in isolation programming a car using a wide range of maths skills. With 100,000 users in 14 countries just reaching this stage is a tremendous achievement. The afternoon started with the teacher’s race; the teacher of each school who had a team in the final had programmed a car for the Monaco circuit. Mr Sutton’s performance was not impressive as he finished off the pace in 20th place. Then came the World Final and initially the Butlers Court car slipped down the leader board, however after the first pit stop they slowly climbed the ladder to finish in second place in the Primary World Championship. The team are to be congratulated on their efforts, which continues Butlers Court fine recent successes in this competition of two first places and a second in the last four years.